True to pictures in color and fabric. Sturdy and washes up nicely. Good color and very soft. 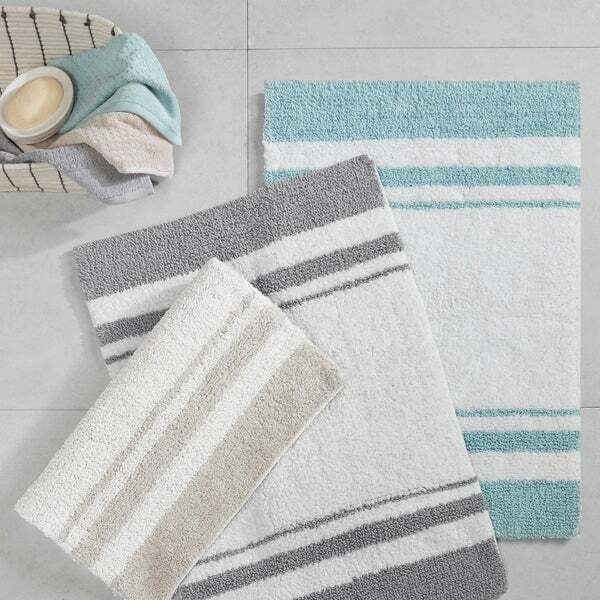 Sink your toes into the plush 100-percent cotton weave of this luxurious striped bath mat. Reversible to ensure even wear, this machine-washable bath rug comes in three sizes for perfect placement in front of your tub or shower stall. Available in a choice of light, relaxing colors, this beautiful rug creates the look of a spa in your master bath. Sheds heavily when washing, doesn't match, etc. I was happy with the grey, Madison Park shower curtain, so I purchased the matching bath rug to go with it. The first thing I noticed is it doesn't quite match. The grey on the rug is noticeably darker than the curtain. It's also a touch crooked. The one side is off by roughly a quarter of an inch, so it's not quite a perfect rectangle. It also sheds a tremendous amount when washing and drying it. It's not worth returning, and it's not completely awful (it's actually not bad on the feet, and it isn't a complete eye sore). I'll likely use it for 6-9 months and then simply dispose of it. Excellent quality of cotton. This rug is definitely spa quality and I love the colors of white and a very light stripe of aqua. I haven't washed it yet, but I want to give others a little knowledge about new towels and/or cotton rugs. I was given this advice from an older lady that had a curtain, drapes, bedspreads, towels etc. She said to put them in the dryer before w/o heat and turn it on for twenty minutes. Remove whatever, clean your lint trap from the dryer and put the article/articles back in the dryer for 20 more minutes. After cleaning the lint trap if there is nothing on the lint trap, your item is ready to be used. When you do wash it, it should not pill up or have pieces of lint on the cotton rug or towels I truly love this rug and would recommend it to a friend. Cute little mat that doesn't shed. That's the extent of the pros. This was way too expensive for the little scrap of a mat you get (smaller sized mat). It has no slip-proof backing on it which I find incredible since it's made for the bathroom. A place that typically has tile, making it a slippery recipe for disaster. To prevent anyone getting hurt, anytime I have guests staying at my house, I roll it up and put it in a closet. Totally defeats the purpose of having a mat. I won't buy a slip proof mat to put under as they never fit and the rugs always manage to slip off that - so it looks crappy all the time. Would not buy again and can't, in good conscience, recommend this to anyone. These are beautiful rugs. I wansn't able to keep them due to the color, which was beautiful but didn't match my shower curtain. It's nice that there is a variety of sizes available. Very soft and reversible. I wish it were available in a little longer size. I like the bath rugs to be washable without a rubber backing. This fits the bill perfectly. This rug is exactly the color in the picture. This bath rug is perfect in our guest bathroom. Plush fibers and highly recommend. This is a small and not terribly thick bath mat. It is showing its wear after a year of use. I bought it because it matches my decor colors. Well constructed but larger than expected. This rug looks exactly as it does on mine. It's very soft and the color is beautiful. The only reason I didn't keep this was that it was too much stripe with the shower curtain. Otherwise they were lovely and soft. Nice quality, reversible, matches shower curtain perfectly, good price. I had a hard time finding the 45" size and this works great in our bathroom! So far I like it. these rugs are perfect for stepping out of a hot bath. small enough you can wash easily. Feels great on your feet. Soft to step on. I like the colors but faded once I washed it. I like that it is absorbent. Received rug and it already had damage to it. Looked as if someone had gotten a spot of dirt on it but instead of washing they just trimmed it off with scissors, leaving a bald spot that compromised the durability of the rug. Sent it back. Otherwise it was a nice thick rug with beautiful colors that would have went nicely with my new shower curtain. Love these reversible bath rugs and easy to maintain and clean. Sturdy and do not slip. This carpet is beautiful but I just wish the floor side was non slip. This rug is cute, definitely as described, seemed a bit smaller than I thought it would be though. Price is pretty good for the product, would recommend. Very plush and good quality. Goes perfectly with the matching shower curtain. Thank you. These look very nice in the bathroom so I bought a few of them and probably will buy a few more in the future. "The sizes you offer are different than the sizes in the rug descriptions. Which ones are correct. " You can choose the size in the options tab. I hope this helps. "How thick is this? " Hello auntp, the rug is approximately 1/2" inch in height. Please let us know if you have additional questions. Thanks for shopping with us! For the color and I needed both sizes. And it's washable.